Digital book printing has almost exclusively produced perfect-bound paperback books, but new markets are opening up for high-value, hardcover digital books, books that function as gifts, keepsakes, and mementos. 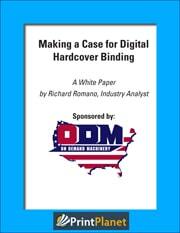 Case binding has often been thought to be out of reach of most digital book printers, but today’s digital case binding systems can bring high-quality and high-value print books in-house, without breaking the bank or your staff. Richard Romano is a freelance writer and consultant for the graphic communications industry and frequently contributes feature articles, news stories, and special research reports to WhatTheyThink, the leading news and information portal for the graphic arts industry. Romano is a former writer and senior analyst for The Industry Measure, for which he writes market research reports on various aspects of the graphic arts, printing, and publishing industries. Romano is the co-editor, with his father Frank Romano, of The GATF Encyclopedia of Graphic Communications, a compendium of more than 10,000 graphic arts terms published in 1997 by the Graphic Arts Technical Foundation.